After graduate school, I was fortunate enough to spend time with my family in Massachusetts before moving out to Colorado. The last year and a half I had struggled with my mother’s cancer diagnosis, my best friend’s little sister’s shocking death, stress dreams leading to insomnia, and depression. Art is a force in my family. My mom is an artist, so was her mother and stepmother, and so is my aunt on the other side of my family. In between visiting with family and friends and preparing for my move, I sewed, I crocheted, I painted, I wrote, and I played the ukulele. Nothing had to be a masterpiece but everything was a piece of my masterhood. The process proved regenerative. All the parts of me that felt depleted and hurt emerged after I had pushed them down to get through my program. I began to fill up. The healing cells in my body proliferating, dancing in my brain and stimulating parts of me that had remained dormant or cutoff. I am not an art therapist; my art-making lacked strategy. My only intention was to create. According to the Art Therapy Association of Colorado, psychiatrists in the 1940’s grew intrigued by the artwork of their patients around the same time educators realized that art could reflect developmental growth in children. From the mid-twentieth century on, art therapy, coupled with talk therapy, surfaced in a variety of settings. Art therapists work in hospitals, shelters, schools, correctional facilities, and other agencies. Therapists run their own practices and also often counsel in the trenches of therapy, seeing clients who have experienced sexual assault, traumatic brain injuries, who have disabilities, who struggle with addiction, anxiety, depression, PTSD, and relationship issues. In a healthy brain, the left and right hemispheres are constantly communicating. According to Bessel van der Kolk (2003), neuroimaging scans suggest that when an individual attempts to recall a traumatic event, the left frontal cortex of the brain shuts down. This includes the Broca’s area of the brain, which is the center of expressive speech and language. In contrast, the areas of the brain that are activated during trauma light up. These include areas in the right hemisphere of the brain that control emotional and autonomic arousal and detect a threat (Crenshaw, 2006). According to Klorer (2005), art-making activates the same parts of the brain as trauma… indicating that art therapy has the ability to bypass the left frontal cortex and stimulate the area of the brain responsible for encoding the traumatic memory. When an individual then processes the meaning behind their artwork with the therapist, they are reactivating the frozen speech area of the brain, and therefore reintegrating the two hemispheres. Art therapy requires a master’s degree from a nationally accredited graduate-level art therapy program. Art Therapists learn assessment tools, processes that foster therapeutic growth for their clients, and other crucial components of therapy. In Colorado, art therapists lack title protection. Anyone who is a therapist can market themselves as an art therapist, undermining the training art therapists receive, mitigating the positive outcomes of the investments art therapists put into their education, and increasing competition over clients interested in art therapy. Most importantly, a lack of title protection potentially proves harmful for clients, when someone who lacks training in art therapy attempts to interpret or unpack trauma or other concerns with a client. If you are a therapist and want to use your gifts to assist others in need, consider volunteering with Metro Volunteers’ Pro Bono Mental Health Program. Contact Caryn Oppenheim, Denver Area Program Manager, at 303-867-0866 for more information. Online Registration Closes on Wednesday, February 28 at 10:00 a.m.
*You will be able to register the day of the event but registration fees increase to $40. The required minimum fundraising fee of $100 will have to be turned in before you may climb. Start times for those who registered after Thursday, February 22 will be announced on Thursday, March1. We will repost start times at that time. We will be offering a couple of different packet pickup times and locations. Click here for the full schedule for packet pick-ups. When you participate in a Fight For Air Climb, you are stepping up to make a positive impact in the lives of those affected by lung disease. Participants raise funds to support the mission of the American Lung Association while training to climb the stairs of a skyscraper. Whether you are climbing alone or with friends and family, as a part of a healthy lifestyle or in honor of all those who are affected by lung disease, you will achieve a sense of personal accomplishment as you reach the top of the building and the height of your fundraising potential. Every step you take moves us forward in our fight for healthy lungs and clean air. 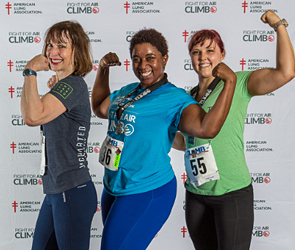 Join us for the 13th annual Denver Fight For Air Climb. This Colorado experience will leave you feeling accomplished and thankful for your lungs when you finish climbing the 1098 steps. Are you still wanting more? Register for the Ultimate Climb, allowing you to ascend the building as many times as you can in an hour. We encourage you to start today and are here to help you, from the first step in your Climb all the way to the top. Contact us with questions or for more information. Registration Information: The earlier you register the more you save! **Ultimate and Ultimate Plus Climbers can select the upgrade during registration for an additional $15-$30. Visit our FAQ page for more information about Elite, Ultimate and Ultimate Plus climbing information. *All participants are required to fundraise $100 in addition to the registration fee in order to be eligible to climb. **Ultimate Climbers can select the upgrade during registration for an additional $15-$30. Visit our FAQ page for more information about Elite, Ultimate and Ultimate Plus climbing information. Please note that all climbers must be at least 10 years old by event day in order to participate. Any climber under the age of 18 must climb with an adult, and must not be left alone under any circumstances. For adults who climb at a faster pace, please note that your child may not be left unattended while you climb. Please make arrangements accordingly. Due to building regulations, your safety, and that of your child, child toting is not allowed. Collecting cash or check donations to support your Climb? Questions about the Fight For Air Climb? Please review our FAQ and Event Day Details pages.